Another glorious day in Maui. I am sitting alone on the beach watching the sunset and feeling eternally grateful for the beautiful day I had. We had a very leisurely morning which started with coffee in bed. Thanks Wade :-). 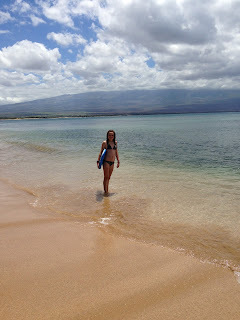 Followed by a long walk on the beach. Breakfast was a simple bowl of cereal and then I went outside to work on my blog. I have to admit it is a little difficult to sit down and work when the ocean is calling my name, but once I'm actually doing it I'm good. I worked until lunch (ham sandwiches for us and KD which the kids cooked for themselves earlier), and then we made our way across the island to do a little shopping and go Zip Lining. 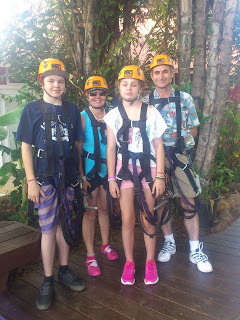 The company we chose was Maui Zipline which runs out of The Maui Tropical Plantation. We had signed up for the five zip tour (they also offer an eight zip tour). The facility was easy to find, clean and well run. Check in was quick and within no time we were being given the safety demo. I liked that the group was small. Only eleven guests and three guides. The guides were great, very friendly, funny and totally open to being filmed and shared on Instagram. Thanks Kate. We did have a great time, for me it was very much about doing this with my family. That being said the Ziplines themselves were disappointing. We didn't zip across a jungle canopy or drop into a cenote as we have done before. There were no mile high mile long lines and the scenery was pretty much the same throughout as their five lines were all together in a space about an acre in size. If you are looking for a family friendly Zipline adventure, one that is suitable for kids age five to about twelve (or older if they are nervous) then this is the tour for you. However if, like me, you are an adrenalin junky then you will be bored. The pace wasn't fast enough and the lines not nearly scary enough. This is a great company with wonderful staff in a nice location. More suited to younger families than thrill seekers.